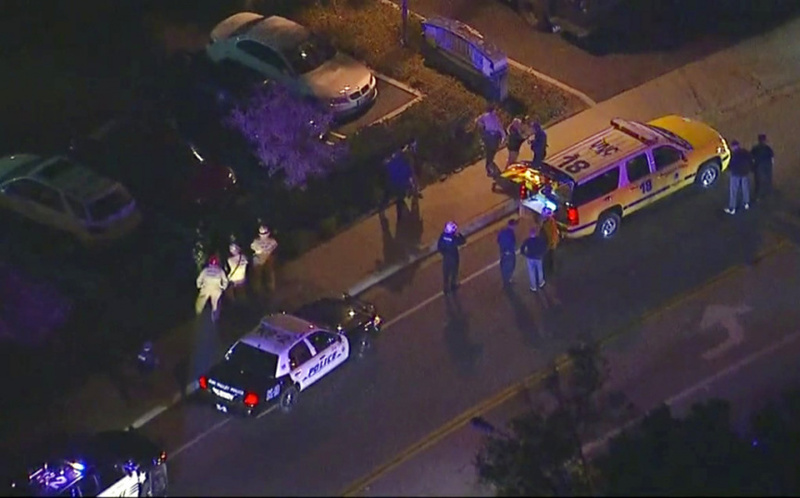 THOUSAND OAKS, Calif. (AP) — A hooded gunman dressed entirely in black opened fire on a crowd at a country dance bar holding a weekly "college night" in Southern California, killing 12 people and sending hundreds fleeing including some who used barstools to break windows and escape, authorities said Thursday. The gunman was later found dead at the scene. The dead from the shooting Wednesday night also included 11 people inside the bar and a sheriff's sergeant who was the first officer inside the door, Ventura County Sheriff Geoff Dean said. "It's a horrific scene in there," Dean told a news conference in the parking lot of the Borderline Bar & Grill. "There's blood everywhere." The massacre was the deadliest mass shooting in the United States since 17 classmates and teachers were gunned down at a Parkland, Florida school nine months ago. It also came less than two weeks after a gunman killed 11 people at a synagogue in Pittsburgh. That, it turn, closely followed the series of pipe bombs mailed to prominent Democrats, CNN and former officials critical of President Donald Trump. Trump said Thursday on Twitter that he has been "fully briefed on the terrible shooting." He praised law enforcement, saying "Great bravery shown by police" and said "God bless all of the victims and families of the victims." The gunman at the dance bar was tall and wearing all black with a hood over his head and his face partly covered, witnesses told TV stations at the scene. He first fired on a person working the door, then appeared to open fire at random at the people inside, they said. Many more people had more minor injuries, including some that came from their attempt to flee, Dean said. Sheriff's Sgt. Ron Helus and a passing highway patrolman were responding to several 911 calls when they arrived at the Borderline Bar & Grill in Thousand Oaks at about 11:20 p.m., the sheriff said. They heard gunfire and went inside. Helus was immediately hit with multiple gunshots, Dean said. The highway patrolman cleared the perimeter and pulled Helus out, and then waited as a SWAT team and scores more officers arrived. Helus died early Thursday at a hospital. By the time they entered the bar again the gunfire had stopped. They found 12 people dead inside, including the gunman. It's not yet clear how the gunman died, and authorities do not yet know his name or have any idea of a motive, Dean said. The bar, which includes a large dance hall with a stage and a pool room along with several smaller areas for eating and drinking, is a popular hangout for students from nearby California Lutheran University who enjoy country music. It's also close to several other universities including California State University Channel Islands in Camarillo, Pepperdine University in Malibu and Moorpark College in Moorpark. Video from the scene accessed by The Associated Press is punctuated by loud sounds of several rounds of gunfire. A terrified witness runs out. Police cars are seen arriving and an armed officer takes up position outside the bar. Three men rush out carrying a bloodied fourth individual. They try to stem the bleeding of what appears to be a gunshot wound. Cole Knapp, a freshman at Moorpark College, said he was inside the bar when the shooting began but thought at first that it was "just someone with an M-80, just kind of playing a prank." Then he said he saw the shooter, wearing a black beanie and black hoodie and holding a small caliber handgun. "I tried to get as many people to cover as I could," Knapp said. "There was an exit right next to me, so I went through that. That exit leads to a patio where people smoke. People out there didn't really know what was going on. There's a fence right there so I said, 'Everyone get over the fence as quickly as you can, and I followed them over." "I screamed to him, 'There's a shooter in there!' He was kind of in disbelief, then saw that I was serious." Knapp said he has friends who haven't been accounted for. Tayler Whitler, 19, said she was on the dance floor with her friends nearby when she saw the gunman shooting and heard screams to "get down." "It was really, really, really shocking," Whitler told KABC-TV as she stood with her father in the Borderline parking lot. "It looked like he knew what he was doing." Sarah Rose DeSon told ABC's "Good Morning America" that she saw the shooter draw his gun. "I dropped to the floor," she said. "A friend yelled 'Everybody down!' We were hiding behind tables trying to keep ourselves covered." AP journalists Andrew Dalton and Michelle A. Monroe contributed to this report.